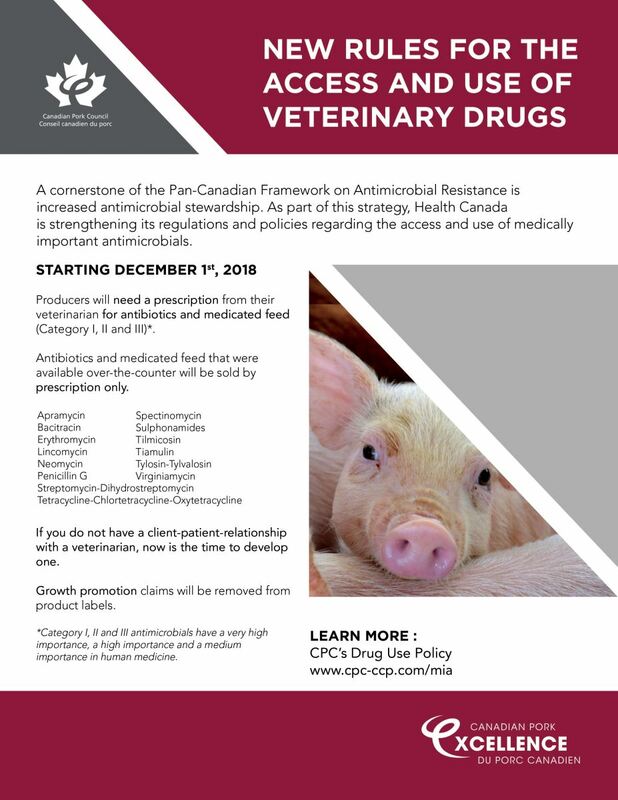 Health Canada is changing regulations and policies regarding the access and use of medically important antimicrobials in animals. Antimicrobials used in human and animal health are categorized by Health Canada according to their importance in human medicine. There are four categories based on whether an antimicrobial is used as the preferred treatment option for serious human infections and whether there are treatment alternatives available. Categories 1, 2 and 3 are considered medically important antimicrobials (MIA). As of December 1, 2018, all medically important antimicrobials will have prescription status and only be available from your veterinarian, or pharmacy. Products containing these ingredients will require a prescription as of December 1, 2018. Pork producers with a valid prescription will be able to purchase drugs (including drugs that may be mixed into animal feed) at a veterinary clinic or a pharmacy. Prescription medicated feed can be purchased through a veterinarian, a pharmacist or a commercial feed mill with a valid veterinary prescription. In order to use medically important antimicrobials in the care of animals, veterinarians will need to have a valid Veterinarian-Client-Patient-Relationship with the animal owner to issue a prescription. A Veterinarian-Client-Patient-Relationship is a medical service relationship between the veterinarian and the farmer for the care of food animals and is regulated by provincial veterinary licensing authorities. According to the Canadian Veterinary Medical Association, a legitimate VCPR is considered to exist only if medical records of the veterinary practice contain evidence of relevant and timely interaction between the veterinarian, animal owner, and animal patients. This may include: farm visits, consultations, direct animal examinations (individual or herd), laboratory reports, production record reviews, etc. Health Canada intends to include all the approved in-feed drug products, including prescription drugs, in the Compendium of Medicated Ingredient Brochures. A veterinary prescription will be required prior to the sale of medicated feed containing a prescription drug. The Compendium of Medicated Ingredients Brochure, maintained by the Canadian Food Inspection Agency, is an important resource for feed mills, veterinarians and producers, as it provides instructions on how to manufacture medicated feeds and directions for use. Animal health product manufacturers will be updating MIA product labels, where applicable, to remove growth promotion claims, update therapeutic claims, add responsible use statements for in-feed and in-water products, along with adding a new responsible use logo. The logo will make these products easier to identify and reflects the animal pharmaceutical industry’s commitment to antimicrobial stewardship. As of November 13, 2017, the own use importation of medically important antimicrobials for veterinary use will no longer be permitted. List B, under the Food and Drug Regulations, will identify those products that are not MIA for which farmers can still import licensed, finished product from another country with a recognized, competent regulatory authority. Although the CPC does not support the use of Active Pharmaceutical Ingredients (APIs) antimicrobials unless used under specific conditions, it is important to note that a regulatory amendment is coming into force May 17, 2018. The amendment expands GMP regulatory requirements for APIs used in human drugs to veterinary APIs when fabricating, packaging/labelling, testing, importing, distributing, or wholesaling. Moreover, people who fabricate, package/label, import and test active pharmaceutical ingredients (APIs) for veterinary use will be required to hold a Drug Establishment Licence (DEL). Finally, pharmacists, veterinarians or those compounding a drug under the supervision of a licensed veterinarian will need a DEL when importing medically important antimicrobials (MIAs) that are on Incorporated by Reference list – List A: List of Certain Antimicrobial Active Pharmaceutical Ingredients. The responsible use of antimicrobial drugs, such as antibiotics, will minimize the development and spread of antimicrobial resistance, and preserve the effectiveness of these drugs to combat bacterial infections. We all have a role to play.